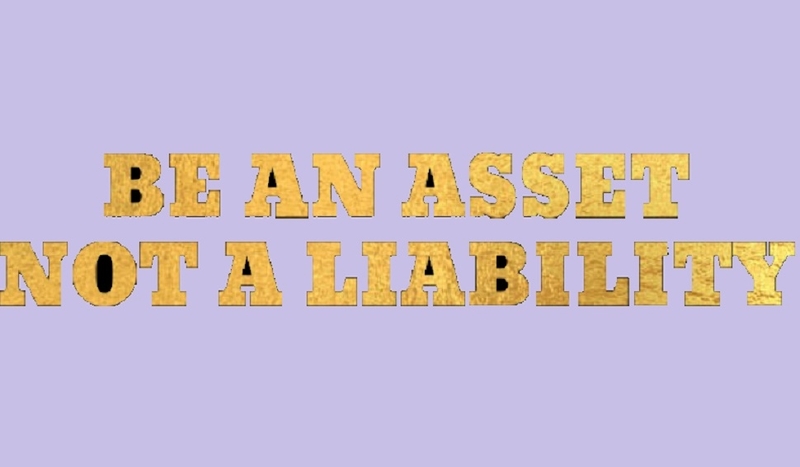 P erhaps this is a language all would understand - assets and liabilities! If I say ‘maturity’ I have reason to believe that even 10 year olds today feel they are matured! ‘Don’t tell me - I know everything’, ‘don’t teach me, don’t advice me’- for I know it all syndrome exists in this age of technological catastrophe. Kids think no end of themselves, teenagers behave like adults ready to get married for they have already proposed to their girl-friends and college students think instead of studying hard they would become a ‘start-up’ and become as successful as ‘amazon’ or an ‘app’ overnight, or become an actor or cricketer and earn loads of money. So money is the language that everyone understands and parents need to explain behaviour in terms of assets and liabilities. An asset would be a person who contributes to the home and family in a way which is needed and useful. A liability is someone who feels he or she is ‘entitled’ to be taken care of by parents and takes others for granted for his welfare. If this attitude and habits continue into adulthood they become like ‘parasites’, living off others without contributing meaningfully and responsibly towards the family. Beginning the training as early as possible, helps tremendously in nurturing a child with a proper personality and character. Most parents with one or two kids pamper and pander to the whims of the child and expect only one thing in return- high scores in education. No other responsibility seems to be demanded from him- ‘you just study hard and leave the rest to us’. So the mother is picking up his shoes, laying his bed in the morning, standing with a glass of milk endlessly while he dawdles in the bathroom, leaving him to school in her scooter for he has missed the bus and then picking his brain at study hours and helping with the home-work. She is doing all the work that should be done by the child himself and asks for nothing in return except- high marks! No wonder then, the child takes his mom for granted and treats her like his slave! Most unfortunate condition! The child later by and by starts holding the parents to ransom by demanding goodies such as video-games, mobile phones, costly lap-tops, pizzas and pastas and what not, if he is to study well and get good marks. Now, sooner or later, it may happen that with the fulfilment of his ‘desires’ (not needs), the child may perform well but by now he would have spoilt his habits. On the other hand, in all probability, he will not show results for he has spoilt his habits by getting addicted to technology and has also become de-motivated for he has nothing more to look forward to. He is bored of it all. Motivation is a big issue among kids today for they seem to have it all and nothing left to be desired but more and more ‘pleasure seeking activities’. This hedonism has corrupted his sense of ‘duty, discipline, dedication and determination’ to struggle for himself and his future. Many parents mistakenly assure their kids of a safe future by telling them that they have saved enough for them and they will neverface hardships. They add that they want their kids to work hard and do well and get into IIT or something as prestigious as that, so that they can be proud in society, but for the kid their parents’ prestige is not that motivating! So it all backfires! Motivation is based on the principle of balancing the ‘rewards and the punishments’. Today the kids have many rewards in terms of goodies and gifts but the only punishment is ‘shouting, nagging and pressure for studies’. This does not lead to ‘punishment’ as such but only mental harassment and stress. This is a lop-sided management principle which will not work. The first practical lesson hence to teach kids is - help mother with the housework - as soon as the child begins to walk around and understand language and instructions. Gradually as the child grows up and becomes stronger make them start doing their own work. ‘Pick up your shoes and put them on the rack properly, lay your own bed, clean your own cupboard, clean your study desk, put your books in order and do your own homework’. He has to get into the habit of becoming independent and not dependent on the mother. The second step is - getting useful for the home and family. ‘Get a glass of water for the father or mother, pick the dishes from the dining table, dust around the house, water the plants’ or whatever little he can do in running the house. These practical habits need to be cultivated as early as possible. And this should be part of daily routine and not ‘once in six months’. Such activities besides inculcating good habits send very powerful messages to the child that - ‘there are rules to be followed in the house’ and secondly, ‘you cannot take parents for granted’ and thirdly, ‘you have duties towards the home and family too’. Many parents today complain of being ‘taken to ransom and taken for granted’. But sadly, parents should realise that their own method of training and discipline is faulty and needs correction. Becoming an asset to the family and not a liability is an important lesson to be taught to kids. We need this strength in their character for building their future and a strong nation as well.